New York (TADIAS) – Guitarist Selam Woldemariam is scheduled to take part in this month’s Summer Stage concert in New York, paying a musical tribute to Ethiopia’s storied resistance against Italian occupation during world war II. The show entitled The Power of the Trinity is an adaptation of a play by American writer, the late Roland Wolf. The stage production is directed by Alfred Preisser and the music is scored by New York-based musician Tomás Doncker. According to City Parks Foundation NYC’s annual “SummerStage” concerts, sponsored by AT&T, brings over 100 performances to eighteen parks throughout New York City. Selections range from pop, latin and world music to dance, spoken word and theater. Selam will perform at Springfield Park in Queens on July 27th and 28th, as well as at Central Park in Manhattan on July 31st. The show will conclude at Marcus Garvey Park in Harlem on August 5th. 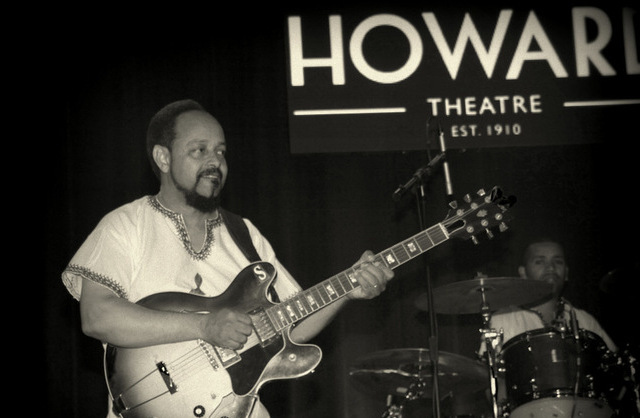 But first, here are video clips from Selam’s recent appearance at the historic Howard Theatre in Washington, D.C. during a Memorial Day weekend concert featuring Mahmoud Ahmed and Gosaye Tesfaye. TADIAS: Please tell us about your upcoming NYC show. How did you get involved with the project? Selam Woldemariam: I got involved with the project 3 years ago, when I met Tomás Doncker. At the time the sons of the playwright Roland Wolf were working to continue their father’s work. They were setting out to complete the play he wrote about the second Italian invasion and Haile Selassie’s leadership role. Roland Wolf’s sons met with Tomás Doncker about doing the score for the play. This was the driving force behind the Power of the Trinity project. Doncker was interested in creating a fusion of Ethiopian music and was particularly inspired by the Ethiopiques CD series number seven. Doncker did not expect to find the musicians from the Ibex band still doing the music thing. So this led to the meeting between Tomás Doncker and I in Washington D.C. one afternoon. I served as a production consultant in the play and co-wrote 3 to 4 songs on the album. The play will feature an all-American cast and I have been working with the cast so that they deliver their lines with an Ethiopian twist. TADIAS: Tomás says you are the Jimi Hendrix of Ethiopia. SW: (Laughter). I call him ‘Gash Tomás.’ I’m happy to have worked with him; he is a man of his word. He is an inspiring individual that really brought out the best part of me. He was so enthusiastic about learning how to play Tizita. It was one of those unique situations that allowed us to really have an open meeting of the minds that doesn’t come around often. We also played together at the Blue Note Jazz club in New York — where one of our sets was completely sold out. Tomás Doncker is also an incredible songwriter he composed an album of 11 to 12 songs it was great to work with him. My job was to maintain the authenticity and infuse commonly known melodies like Tizita, Anchi Hoye, Bati, and Ambassel; translating important highlighted words from the songs. I chose Tsegaye Selassie from Lasta Band for his unique voice that is most known for the ancient, raw folk sounds that are heard throughout the old city of Roha, which is known as Lalibella. Commonly known as Lalibeloch, they would go out into the city and sing spiritual songs early in the morning. We added 3 to 4 new compositions, which included Mahmoud Ahmed’s newest Guragigna song. TADIAS: How would you describe the music and what are your expectations for SummerStage? SW: The genre is classified as global soul, because it connects the world with the sounds of Africa, specifically traditional Ethiopian melodies, which is classified as pentatonic. I am excited about playing on some of the most prestigious stages in NY. I expect a large turnout with people from all over the globe, because it is a transient and global sound. It is very different. I believe that this is a great opportunity for people to experience Ethiopian music. SW: I was born in Addis Abeba where my father was the Director of one of the first school that was established for the vision impaired. I grew up in Kazanchis on the compound of the school. The Missionaries from the Protestant Church were the teachers at the school, and this is where I was first exposed to music and singing. My father was later commissioned to be the director of the second school in Asmara. That’s when I started to get involved with music. In Asmara we put a quintet band together, which was a church group that I formed at the age of 11. We were very popular; we had so many supporters and were highly encouraged. Right after I finished high school I joined the Black Soul Band with members Alemayehu Eshete, and Slim Jones, and toured with Orchestra Ethiopia in 1973. Orchestra Ethiopia is mostly known for Tesfaye Lemma and his group, who did their first and last tour in 1969 when they traveled to the U.S. with Charles Sutton. The band broke up so Hailemariam G. Giorgis the keyboard player and I went to play at the Venus club. Months after, the Zimbabwean guitarist left Ibex Band and so they were looking for a guitarist. This is when I joined the Ibex band and shortly after brought Hailemariam with me. This is when it all began. The first recording was Ere Mela Mela by Mahmoud, which later became Ethiopiques number seven. That’s when people began to recognize me as a guitar player. We produced most of Mahmoud’s music, and an album for Tilahun Gessese, and one for Aster Aweke, these recordings spanned from 1975 to 1978. The most important recording at that time was the Ibex Instrumental where musicians like Abegaz, Henock, and Fasil started their humble beginnings. They all have mentioned this music during their interviews. During this time in 1979, is when the vinyl era began to decline and the cassette tapes appeared in the market. Then, three members of the Ibex Band: Giovanni Rico, Fekadu Amdemeskel, and I, formed the Roha Band. During this time Roha band recorded close to 250 albums. Most of the Roha recordings were done in the basement of Ghion Hotel that was our Motown. TADIAS: We understand that you are also writing a book. Can you tell us about it? SW: Yes, this will be a book about my reflection on Ethiopian music. It’s a subject that not many people write about. I have kept a memoir of the events and concerts that took place when we were on tour. I studied History at Addis Abeba University where I graduated in 1988; my senior essay was titled “Origin and development of Zemenawi music in Ethiopia (1896-1974)”. I prefer to say Zemenawi and not “Modern” because the word “modern” implies that the music is somehow better in terms of quality, which I don’t believe it is. I have pictures and of course a database of music that was produced during the era of what is known as the ‘Golden Years of Ethiopian Music.’ I’m currently looking for a grant to finish the work. TADIAS: Regarding your guitar, why are you so in love with Gibson 335 ES? SW: (Laughter). When I joined Ibex band at the end of 1974, my guitar was a Yamaha and then I started to listen to Crusaders and the guitar player Larry Carlton. And he plays the Gibson 335 ES and I have been greatly influenced by Carlton who is known for his elements of Blues. I had a good friend of mine who brought me the guitar back in 1979 from NYC. During the communist regime it was not so easy to get things into the country. Some time after I received the guitar, I heard through the grapevine that someone was selling the same guitar. Come to find out my friend had bought two and was trying to sell the other. So I caught up with him and took the guitar for half the price because he tried to sell my style guitar behind my back. So I have two Gibsons, which I refer to as the twins. TADIAS: Thank you, Selam, and best wishes from all of us at TADIAS! Live global-soul music sets the backdrop for SummerStage’s world premiere of The Power of the Trinity. Click here for complete schedule. Excellent interview. I have known Selam for ages and he is a great human being. Addis ababa misses his presence. Good luck this summer and just may be, I will get to see him this summer. What a beautiful story and life experience. I love selam, and a very talented individual. I wish him all the best, and keep playing. He is a living legend! Selamino you are so great! Selamino has influenced more musicians than any other Ethiopian instrumentalist in history. He’s still performing and recoding. Long Live Selamino. This is great stuff Selaminoz ! you told it like it is, I am always proud ! I will visit NYC on 28th and it will be good to see you there.